How could he know? 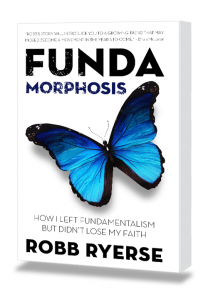 That question surfaced in my mind over and over again as I read Robb Ryerse’s new book, Fundamorphosis. How could someone I never met, who lives many miles away, who has an entirely different background than me– how could such a person experience nearly the same kind of transformation that I have been going through? 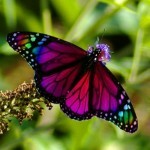 The answer is straightforward: God is transforming cocooned Christians in our generation. One of the most important take-aways from Robb’s book for me is the need for each generation of Christians to seek out and embrace ourselves, our God and our theology in the sea of change. Fundamorphosis challenges us to go beyond a “receive and believe” approach. Throughout history, Christianity has been represented by various symbols. Each generation has struggled to understand the words of Jesus and the Bible authors. We have much to learn from them. The cross was the first symbol, and remains the most important. The fish was used early on, no doubt due to the fishermen Jesus called. Robb does not dismiss the early tradition and rich history of Christianity. In fact, he points us toward such things, with the hope of instilling a new desire for satisfaction from our Christian faith. At the same time, Fundamorphosis is an invitation to find a new identity. 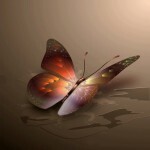 The identity of the butterfly, and the related metamorphosis process, captures the essence of what God through the Holy Spirit is doing around the world today. I say this with confidence based on my own transformation out of my own cocoon of evangelicalism and based on thousands of online and in-person conversations with Christians from around America and around the world. The power of Fundamorphosis lies not in introducing some “new theology” or a “better system of answers”, but in capturing one man’s transformation out of a static, burned-out, joyless Phariseeism and into a vibrant, ever-changing Christ-followership. Yea I made up some new words. Immediately I could sense Robb’s love for those who “believe with certitude” the tenants of fundamentalist Christianity. Unlike others in our generation, Robb does not condemn fundamentalist Christians. Instead, Robb tells the story of his own journey. At one point he declares: “I still love the church”. Robb is on an amazing journey, but he has not given up on church. With grace and careful thought, Robb invites all of us to a deeper faith, a more flexible commitment and a broader inclusion of people. Fundamorphosis is filled with words of hope and life and joy from beginning to end. It may be that many will read his book secretly (Kindle is a good way for that) Those who do will surely find love, not judgement or dismissiveness. Just as a caterpillar might wonder what is happening as the cocoon spins around it, Robb is candid with his and his family’s struggle. His transformation was not without a “dark night of soul”. With vivid memories interwoven into his narrative, Robb gives us a real look into his struggles. Such vulnerability is much needed today. One of the threads throughout Fundamorphosis is Robb’s personal self discovery journey, a journey that includes both doubt and faith. St. Augustine’s prayer regarding “self” and “God” is certainly true. Fundamorphosis is a snapshot of what God is doing in our generation. These are not times of doom and gloom, but one of the most exciting and hopeful times in all history. Thank you Robb for articulating the essence of what the Spirit has been teaching me and for expressing what is on the minds of many! This entry was posted in Reviews, Slider.